I feel we are in need of some good news: balancing and alignment is complete and the set is now being uploaded into SVN! I'm planning an official pakset release soon so I'd be grateful if people could test these and let me know of any problems prior to a release. For the standard pakset only a limited selection of the liveries are available (1 per train) but all the images are in SVN so you can use them if you prefer. @jamespetts - ask me if you need any help suggesting dwell time/upgrade/livery details for experimental. Some people on the French forum also seem to be doing the Paris metro: see here. Resurrecting this topic ahead of the second stage: subsurface line stock. I wasn't planning any more locos as the A-class and E-class are already there, covering the two most prominent basic designs. For experimental though I suppose you might want a few more liveries (including A-class in District livery if that was different?). Here is the list of plans as it stands, if anyone has any further comments or ideas? I think that that list is missing the Q38 stock. We could also probably do with one or two more Metropolitan steam locomotives (perhaps the C Class (1891; this was essentially the same design as the SECR Q Class of 1881, so could be made available in multiple liveries in Experimental), the F Class (1901), the H2 Class (1920; this class moved to the LNER after nationalisation of London Transport in 1933) and the K Class (1925; this also moved to the LNER in 1933)) as well, as you suggested, as a Metropolitan District Railway livery of the A class (which needs to be re-scaled). The Metropolitan four-wheel carriages were at first close-coupled in pairs and a specimen of 1870 is illustrated in the endpapers. Each body was 20ft long and contained three first-class or four second- or third-class compartments. The eight-wheelers were identical as to coach-work and just twice as long. Width over mouldings was 8ft. 3in. and the maximum inside height 7ft. 1in. Iron-spoked wheels, 3ft. 6in. in diameter, were used, with 5ft. steel springs. The frames were of iron. The Metropolitan first-class compartments seated four passengers on each side, with intervening elbows, but the thirds, and even the seconds, were rather deplorable. The former had low-backed wooden seats with the partitions only 4ft. 10 in. apart, and the latter at first differed merely by having thin cushions of the seats and a strap squab along the top of the back. Handrails - forerunners of the too familiar straps and grips in the open cars of our time - were bracketed to the roofs. A prominent feature of the bodies on Burnett's Metropolitan carriages, in addition to the round-topped doors, was the provision of small toplights to the quarterlights. These were copied by several railways; the Midland took them up as late as the nineties and built them into the beginning of the [20th] century. District Railway coaches were very similar to those of teh Metropolitan, but were exclusively four-wheeled. Some of the old Metropolitan carriages had very long careers. Two eight-wheelers of the original design, dating from teh early eighties, were to be seen on the Quainton Road and Brill line until the beginning of the nineteen-thirties. Illustrations of the four wheeled type (as used mainly on the District but sometimes also the Metropolitan Railway) are in the endpapers of the Hamilton Ellis work, whilst a photograph of one of the 8 wheel carriages of 1866 vintage in latter days (without its roof-mounted gas tank that looked from the outside a little like a clerestory) is to be found on p. 406 of "The History of British Railway Carriages 1900-1953" (David Jenkinson, Pendragon, ISBN 1-899816-03-8), who notes that these carriages were nicknamed at the time "Long Charleys", although they are also referred to as "Long Toms" by R. W. Kidner in "A Short History of the Railway Carriage" (Oakwood Press) at p. 93, which also illustrates one. Jenkinson's work also contains a number of useful illustrations and details of some of the stock that you have listed above, which I mention in case you are short of information about such items. As for the Q38 it appeared to me to be basically the same as the O/P/R stock which is in the list and overlaps time-wise, so it didn't seem to make sense duplicating it. Early carriages - can you post any images as they seem hard to come by on the internet. Hmm - I do not wish to infringe the author's copyright in the images, and I am not sure whether it has expired or not. Would you like me to produce the hauled carriages of early times? It might be worth adding North London Railway stock whilst we are about it. As to the R/Q vehicles, their history is a rather complicated one, but I think that the Q38 motors were used in conjunction with a whole variety of earlier stock which was retrofitted with automatic doors and designated "Q stock", whereas the R stock motors (and "R38" motors to which the Q38 motors were converted) were used with R stock trailers. One would not need different graphics for them (although there would need to be red/white liveries), but it would be odd having "R stock" introduced in 1938. I admit, Q stock is not an easy thing to deal with in Simutrans. Perhaps it's best if you do the coaching stock, you seem to have a good collection of references which I don't have - although I've already done 8-wheeler Met Ashbury coaches from 1863. I'll produce graphics for the EMUs I listed above - it gives enough of a selection for standard. You can then reuse these for various upgrades in experimental if that helps. On second thoughts I will produce more Met steam locos. I'll do livery variants based on your A class. Ahh, lovely, thank you for those. Would you mind uploading the .blend file? It would be useful to produce an earlier variant (which I will code as a livery variant) showing the gas holder on the roof, and it would be useful to use these as a base for the 4-wheel versions used on the District. As for the EMUs - the graphics on your list will probably suffice, as there were no outward differences between the Q38 and early R motor cars. In respect of A class livery variants; do you plan to re-scale it first? It does need re-scaling, I think. I can find the correct length if that would help. Edit: Some interesting information here about District Railway stock, including an example of the later brown livery carried (the original livery being varnished, no doubt very similar, therefore, in appearance to the Metropolitan livery). Edit 2: There is also some rather useful information here. Have just emailed you the blend files as they are too large to upload here. The .blend files are available on my Github repository. I have renamed the files using "met-" instead of "mr-" so as to avoid confusion with the Midland Railway, all of whose vehicles are named using the "mr" abbreviation. This also makes the carriages consistent with the existing Metropolitan railway vehicles in the game. Ahh, splendid. Evocative as the older units are, the S stock manages, chiefly on account of its superior ride quality, to be considerably more comfortable than much of what it replaces. D-stock. I've also done the refurbished LUL corporate livery variant for experimental. I also have discovered that the earlier Metropolitan 8-wheel carriages that I showed in my last post were not correctly scaled: even taking into account the distortion factor of 1.25 in the x and z dimensions (the x and z dimensions being at 1.25 the scale of the y dimension), the carriages were still too tall and too wide based on the measurements given in the quote above. I have now re-scaled them, and the graphics visible above show this new scale. Also, good work on the D-Stock. A timely addition, as it makes its farewell tour but next month, I believe. One small thing: did they not have front cab doors a little darker than the surrounding? On some photos it seems to have a different colour end door as you show but on others (such as the one I was working from) it isn't noticeable. I think I will add it - it makes for a bit more interest than a plain white train. EDIT: A-stock done. These are all looking a bit similar now, but I suppose they do in real life too. The re-done C stock has a gangway door looking a bit like the one you can see in the A-stock below. Yes, they do look rather similar in reality - and I agree with you about the inconsistency in appearance of the door on different units, although I always remember the darker door, which I think looks a little better. A-stock looking good, too. Would you like me to re-liver and re-scale the A-class since that was one of mine originally? Would you like me to decide on the appropriate shade for Metropolitan red/purple or would you like to suggest an RGB value? 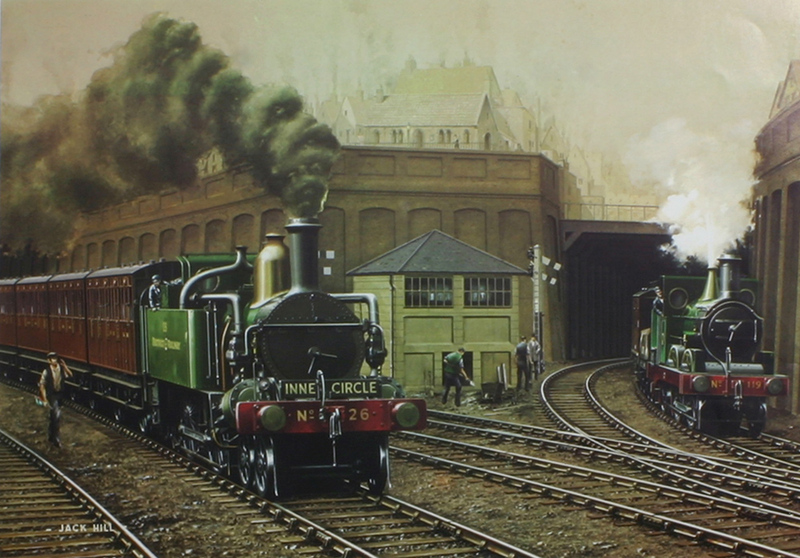 I think that I am correct in surmising that the District Railway only ever had the one type of locomotive which was nearly identical to the Metropolitan A-class (and which I shall produce as a livery variant of it), which had a green livery - presumably the basis for the line's colour scheme now. Incidentally, I have found some interesting information on 4-wheel carriages produced for the Metropolitan in the 1880s, the "Jubilee" carriages, longer than the 4-wheelers used on the District. The District, always financially less well off than the Metropolitan, appears to have retained its original coaching stock until electrification in the first few years of the 20th century - I cannot find any information on later carriages, although I suppose that there might be some. Excellent again. Quite happy for you to do all the steam locos and coaching stock. I'll work backwards through the EMUs and we'll meet in the middle somewhere. As far as I was aware the District steam locos were essentially identical to the Met A Class but green, so a livery variant is best. O and P stocks (a single vehicle type as I've drawn them as they are so similar) in red and R stock in white. For experimental the R stock should have a red livery too using the OP graphics - visually pretty indistinguishable but a different arrangement of motor cars apparently. Splendid! Any thoughts on the Metropolitan colour scheme? Some of the existing locomotives drawn by Kieron have a purplish colour, but I am not sure what the colours in Blender were, and apparently the .blends have been lost. 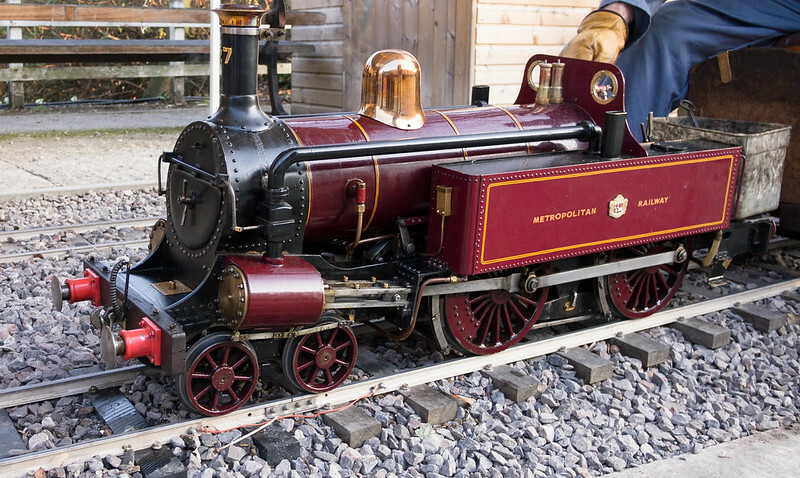 I suggest that the Metropolitan Railway midcared red version is used for Standard, as this is probably the most well known livery and the one in which the sole preserved example is displayed. Edit: For reference, the Metropolitan midcared livery colour in Blender is (in HSV): 0.965, 0.770, 0.325. The New Trains they you have be make Looks Very gerat out. Thank you, Greenling. These are not all new: some are re-rendered images of existing vehicles in the pakset (such as the bogie carriages and the A Class locomotive), but the earlier carriages are new. Incidentally, what is the plan with the Dreadnought carriages and T-stock? According to our current arrangement, with me doing steam hauled stock and locomotives and you (The Hood) working on multiple units, I am set to do the dreadnoughts and you are set to do the T-stock. This seems unwise, as the T-stock was closely based on the dreadnoughts; any thoughts as to what best to do with these vehicles? Good work! It probably makes sense for you to do the T stock in that case. It was next on my list but I haven't started. I'll stick to the District EMUs. PS Do you intend doing the SECR Q1 Class as a separate loco or a livery variant? We don't have any SECR locos at the minute I don't think but no reason not to in the future. Very well - I shall do what later became known as the T-stock (although that was a London Transport name for it - the Metropolitan called it the "MV/MW Stock" (MV for vacuum braked stock or MW for air braked stock), and I generally take the view that it is best to use contemporaneous names rather than retronyms where possible (although we have made an exception, I am aware, for BR built rail vehicles later assigned TOPS designations)). I shall also do the multiple unit conversions of the Ashbury stock that I do not think was on your list. 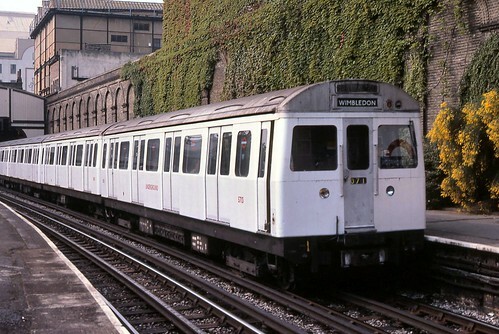 As to the SECR Q Class, it is not an entirely easy question whether it should be a livery variant, as it had a totally different name (and, of course, the Metropolitan version had condensing apparatus). My plan was not to do SECR things for quite a while, the NLR, SR, LSWR, GWR, GNR and LNER all taking priority (the SECR being functionally too similar to the Brighton line in which I have produced a full timeline, and having the added complication of having merged in the late 19th century), and that is not counting the more pressing non-railway and even non-pakset priorities such as 'buses, assisting Giuseppe with aircraft and much balancing/coding. My general approach in respect of railway vehicles has been to do batches of the same railway company's vehicles to give a comprehensive time-line of that railway company (as we are currently doing with the Metropolitan and District railways, and London Transport's continuation of them after nationalisation) so as to have a coherent set. This means that there is plenty of time to decide what to do about the SECR Q Class unless somebody else has a burning desire to produce an SECR/LCDR/SER set any time soon. Sounds good to me. I agree MV/MW stock is preferable to T stock. I have now finished the graphics for the Metropolitan Railway motorised stock of 1906, a conversion of the Ashbury bogie stock of 1898. Graphics for this were already in the pakset, but, as the .blends had been lost, it was not possible to modify them to different liveries, so it was better to start again. I have now added the .dat files for all of the above items, together with consequential changes, here.